Currently on their first US tour, INHEAVEN rolls through DC this week (as in 4/11 at U Street Music Hall, to be exact - get your tickets here!). I've been dying to see the London foursome's gloriously fuzzed-out song stylings for a while now, so as you can imagine I'm looking forward to tomorrow night's show. And I'm certainly not the only one. 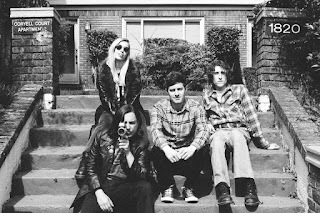 Read on for the band's thoughts on Bermuda, mosh pits, and near-death experiences on motorcycles, and be sure to be at the U Hall Wednesday night to see INHEAVEN do wonderful things on stage. INHEAVEN: I think touring America for the first time is a great moment for any young band. We take a lot of our influences from American Rock'n'roll history so it’s amazing to play on the same soil as some of our heroes. Sonic Youth, Pixies, every artist on Creation Records. Safer than I do on the ground. No, every city has its own way of living and that’s a beautiful thing. Yes. We want to change kids opinions on guitar music. People ask me how they can be in a band too. We like fans to lose themselves. My favourite thing is seeing all genders in the mosh pit together. Songs always start on the guitar. I then demo them in my bedroom whilst watching projections of images to incite my imagination. No, we are always in the moment. Be yourself and don’t worry what other people think of you. Riding a motorcycle and pulling out without looking. A lorry missed me by an inch. For us it’s a combination of musicianship, entertainment, management, design, and artistry.